Step into a yellow-tinted desert haze. Madame Gandhi is the project of LA-based musician and activist Kiran Gandhi, who you may know as the former drummer for M.I.A. and Kehlani. Kiran has been releasing electronic tracks with the aim of elevating the female voice, the latest of which is "Bad Habits"—a percussion-driven meditation about improving yourself inspired by Fela Kuti. 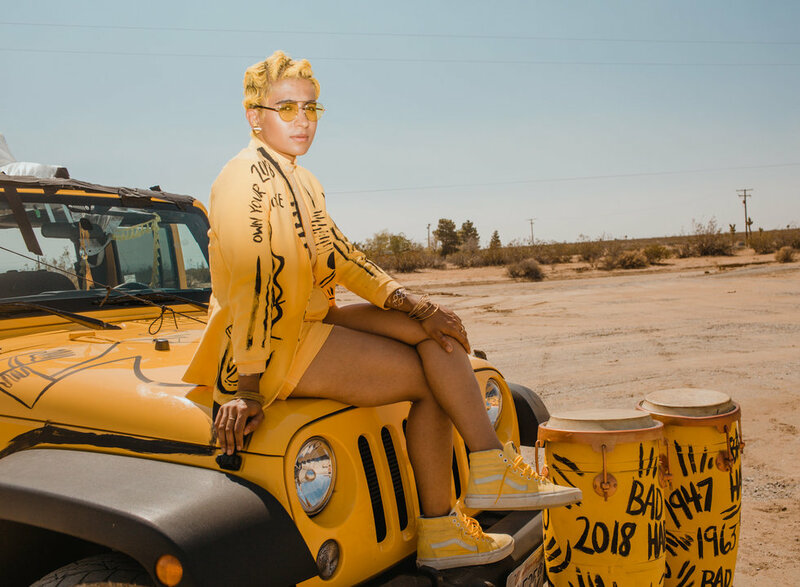 The track, which was co-produced by Madame Gandhi and Dallas up-and-comer Zach Witness (who produced Erykah Badu's But You Caint Use My Phone), is now getting a beautiful new desert visual that we're premiering here today. "The music video for Bad Habits explores themes of building the world we want to live in. Reimagining education, self-improvement, collaboration, radical self-reliance and prioritizing joyfulness as way of serving humanity. It was the yellow world of my dreams that I got to bring to life with London-based director Raine Allen Miller," Madame Gandhi tells OkayAfrica. "In the first verse, I focus on what has been troubling me, as I drive out to the desert and gather other like-minded individuals who also want to find truth and be their best selves," she continues. "In the second verse, I build 'Gandhi School,' in which I share with the others my thoughts on the profound linked history between how Fela and Gandhi were combatting oppressive colonizer rule in their respective countries of Nigeria (1960s-70s) and India (1940s), and specifically how Mahatma Gandhi's non-violence movement drew from the womxn's suffrage movement in the 1920s." "It is about connecting the dots between how those movements were all linked in combatting the same oppressive forces that very much still exist today, and how the best tools for continuing this fight for freedom is to start by being the best version of yourself. I hope you watch, share and critique this video, as it was a joy to conceptualize and bring it to life for you to enjoy!" Watch the new video for "Bad Habits," directed by London-based filmmaker Raine Allen Miller, below.